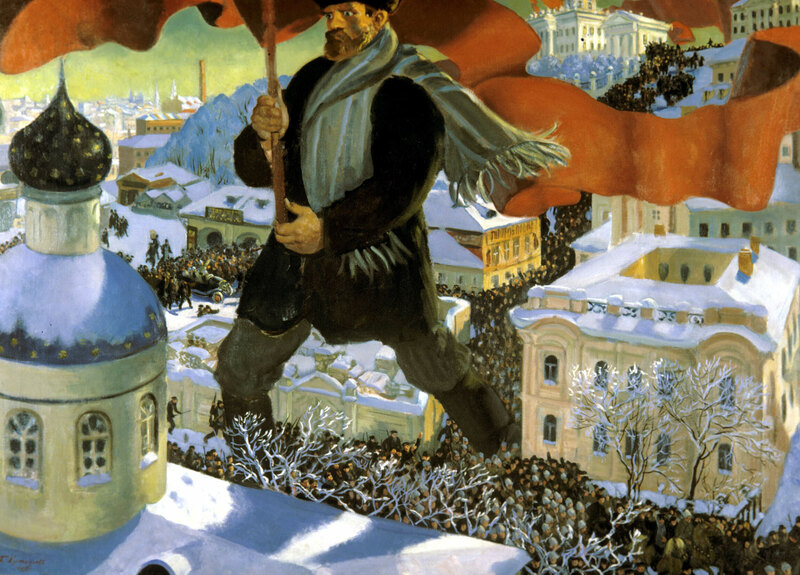 Boris Kustodiev’s painting 'Bolshevik' (1920) depicts how the Revolution was made by the nation. Many in the West are predicting turbulent times for Russia in 2017 but economic figures and the political reality tell a different story, Bryan MacDonald shares his views, and those of some leading experts, on whether a new revolution in Russia is possible. Bishop George Berkeley, the sage of Ireland’s medieval city of Kilkenny, is remembered for his memorable observation of how “Esse est percipi.” That is, “To be is to be perceived.” If the great man was right, for consumers of western media, then modern Russia is a country that is constantly in cycles of collapse, with a rapidly diminishing population and a grim future. In this cliché-ridden world, its brittle elite fights under the carpet, to paraphrase a Winston Churchill expression that some pundits wheel out to suggest special insight. These are usually the same folk who twist the “K” in KGB to “Ka” in English, to give the impression they know more than you do. Viewed from Moscow, these pronouncements don’t look very realistic. Looking back at Russian history it’s easy to conclude that Russia has rarely been more stable than it is today. Despite the economic crisis of the past three years and negative GDP growth rate in 2015, people continue to deposit savings in banks and take out mortgages (up by a third, year-on-year, in the third quarter of 2016). Russia’s economy grew by around 70 percent from 2000-15 (ie, in the Putin era), which was about twice the growth America enjoyed in the same period. Also, since 2009, the country’s population has been increasing, reversing a decline that started in the late Soviet period. And the birth rate is higher than in most other European countries. Plus, there’s also the little-publicized fact that only Germany and the US attract more immigrants than Russia. Which will surely be an eye-opener for British readers after the referendum vote, where migration loomed large. However, certain western academic journals and media outlets refuse to acknowledge these realities. So, here we are on the cusp of the 100th anniversary of two of history’s most tumultuous events, the February and October Russian revolutions of 1917, and there are predictions that history might repeat itself. Already this year, billionaire George Soros has vouched for the 2017 bankruptcy of Russia, which is set to erode Putin’s approval ratings. Not to be outdone, Reuters asked, “When will Russia break?” and concluded that next year was very plausible. And for its part, Foreign Affairs thinks it is “lights out for the Putin regime”. If it all makes your head spin, remember we are still in 2016 and its only the dress-rehearsal stage right now. However, such speculation is not restricted to external voices. Recently, a prominent Moscow professor, Valery Solovey, made a series of extraordinary predictions in an interview with Moskovsky Komsomolets newspaper. The fact that Prof Solovey is considered close to inner Kremlin circles – and correctly signposted previous personnel changes – served to fuel more chatter. “In my view it will be like what happened in the USSR in the late 1980s and early 1990s when the disgruntled city dwellers, the Soviet middle class in the shape of the engineering and technical personnel, protested together with the industrial working class. I imagine the touch paper will be demonstrations in industrial centers caused by mounting socioeconomic problems. The old methods of responding will be inappropriate in this instance. You can easily disperse hipsters [a reference to the 2011 Bolotnaya demonstrations] in Moscow, but you will not deal with Putin’s electorate in that way,” he said. Solovey also doubted whether the authorities would be able to halt the momentum. “It used to be simple – the money was there. There is no money now,” he warned. While Solovey’s opinions are worthy of some respect, they are completely out of sync with the majority of experts on the Russia circuit. For instance, Vladimir Soloviev, host of a popular eponymous evening show on Russian television, snorts when asked to consider the prospect of an insurrection redux. “History never repeats itself. Not day by day or year by year. So the magic of digits, known to Kaballah, doesn’t work directly. It didn’t reflect 1817 or 1717, so there is no logical reason to believe in this,” he says. "Revolution is not an option. Looking back, the main reason in Russia for unrest is if the people in power are weak, not the mood of crowds. Upheaval can only happen if power hasn’t the will to protect itself and that is what happened in 1917 and 1991. They were due to a coup inside the power around (President) Gorbachev and (Tsar) Nikolai. We don’t have such circumstances today," Soloviev added. As the editor of Business New Europe magazine, Aris has an economic reporter’s perspective on Russia’s current status. Hence, his positions are more analytical than emotional, which is a rare thing on this beat where media people can often be highly ideological. “On the economic front, the economy is starting to recover. Real incomes were growing by 2 percent, as annualized in October, and nominal incomes have increased by 5 percent. The ruble has appreciated too (especially against the euro and sterling) which makes foreign holidays a bit more affordable again and that also bolsters the good mood,” he says. For many in Ukraine, Russia is the enemy, but local experts do not consider the situation in Russia to be dangerous. “I don’t think that Russia faces a different revolutionary situation to what the whole word does… I think the Kremlin is very much aware of the need for change and trying to cope with it in its own way. Such as generational exchange, reformatting the power structures, including potentially the presidency,” says Balazs Jarabik, a visiting scholar at Carnegie Kiev.